Title: The Problem of God in Modern Philosophy Author: Leonardo Messinese Imprint: The Davies Group, Publishers soft cover 96 pp. $16.00 US ISBN 978-1-888570-82-3 April 2005 Messinese examines the ideas of God at work within modern philosophy, including Descartes, Hume, Kant and Hegel, and demonstrates their contemporary significance for thinking about God. Ultimately, Hegel's thought is the site of greatest opportunity for understanding the relationship and the difference between philosophy and theology. For Hegel, God is understood as "immanent transcendence," and this is the highest achievement of modern philosophy, in contrast to a theology that sees God as pure transcendence in faith. Contents Preface by Armando Rigobello Introduction — What is Modern Philosophy? 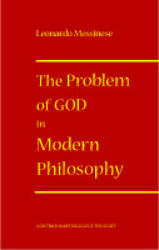 Chapter 1 — Modern Philosophy and the Problem of God Chapter 2 — The Problem of God. The Rationalist and Empiricist Perspectives Chapter 3 — The Kantian Critique and the Hegelian Solution to the Problem of God Chapter 4 — Philosophical Theology and the Demonstration of God’s Existence Conclusion — Questioning the Immanentist Interpretation of Modern Philosophy Appendix — Modern Thought and the Search for God Review “Messinese begins his analysis by reflecting on two interpretations of modern philosophy: one, which views modern philosophy from a strongly systematic point of view; the other, which considers it as an implicit nihilism; yet both interpretations dovetail in that they see modern philosophy as placed in radical opposition to ‘Christian-Medieval’ thought. The Author then hypothesizes another less radical interpretation, thus bringing to the conversation a strictly immanentistic interpretation that a consolidated tradition offers concerning modern thought. Hence, he arrives at this conclusion: “In the modern period, upon close examination, beyond a certain configuration of philosophy as ‘separate’ from religion, other frameworks have been given, in which Christianity has shown even more its ability to favor the development of an authentic ‘philosophy’, particularly, in valuing the ‘interior’ way of man’s relation to God in allowing such a reflection about God so as to develop a ‘richer’ concept of him on the strictly rational level.” We are grateful to Messinese because, with his argumentative strength, he has allowed us to see with greater depth and accuracy that which perhaps we were tempted to consider already acquired and indubitable.” — Rivista di scienze dell'educazione Author Leonardo Messinese is Full Professor and occupies the Chair of History of Modern Philosophy at the Pontifical Lateran University in Rome. His publications include Essere e divenire nel pensiero di E. Severino. Nichilismo tecnologico e domanda metafisica [Being and Becoming in the Thought of E. Severino: Technological Nihilism and Metaphysical Questioning], considered one of the most accomplished works concerning the renowned Italian philosopher, Severino; Pensiero e tras-cendenza. La disputa Carlini-Olgiati del 1931-1933 [Thought and Transcendence: The Carlini-Olgiati debate from 1931-1933]; Invito alla lettura di Cartesio [Guide to Reading Descartes]; Heidegger e la filosofia dell’epoca moderna. L’«inizio» della soggettività: Descartes [Heidegger and the Philosophy of the Modern Age. The “Beginning” of Subjectivity: Descartes] (he received the Capri–San Michele Award for this work on Heidegger); and Fondamento e fondamentalismi. Filosofia, religione, religioni [Foundation and Fundamentalism: Philosophy, Religion, Religions], which he co-edited. He is Coordinator of the international philosophical journal Aquinas and Secretary for the Rome section of the journal Filosofia e Teologia [Philosophy and Theology].